The SEERS Medical Atlanta A&E Patient Trolley has been designed to assist in patient transportation, examinations, full x-rays, and resuscitation. It is ideal for use in acute healthcare departments, and includes a fifth wheel for improved manoeuvrability in between rooms and departments. The Atlanta A&E Patient Trolley has been designed to provide patients with reliable support and transportation in acute healthcare environments. It can be used for examinations and resuscitation, and as patient transport between departments. Further enabling the trolley to be used in a versatile range of settings, the A&E Atlanta Trolley is widely adjustable. The height can be altered from 58cm to 91cm for safer access, and the backrest can also be adjusted to +90˚ for patient comfort and support. The trolley also accommodates Trendelenburg tilt to +16˚ and reverse Trendelenburg to -16. This further allows the trolley to be used during a multitude of examinations for versatile use and subsequent value for money. 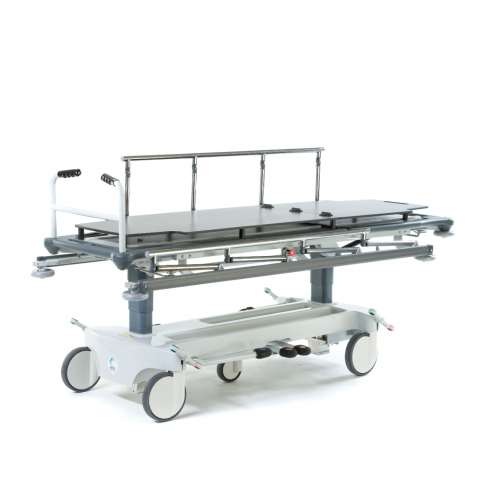 The SEERS Medical Atlanta A&E Trolley includes a deluxe 100mm mattress as standard. This mattress is pressure reducing, boosting patient comfort during examinations and transportation. Please note that the SEERS Medical Atlanta A&E Patient Trolley has an estimated delivery time of approximately four weeks. We apologise for any inconvenience that this may cause and advise you to consider this lead time when placing your order.